I listen to NPR a lot; I enjoy the depth of their stories and news features. I usually listen to NPR as I drive – it presents me with the opportunity to learn about my world instead of listening to crap commercial radio stations. NPR gives me a different perspective that I’m not sure I would get otherwise. The stories are such that I would not likely hear them on commercial television or radio. That being said I don’t always agree with their take on things but it is always educational and provocative. So the other day while I was driving I listened to this brief story on NPR. It was a StoryCorp piece (http://www.npr.org/2015/02/20/387309723/pain-but-no-regrets-a-father-remembers-his-adopted-son?utm_campaign=storyshare&utm_source=facebook.com&utm_medium=social&fb_ref=Default ) about the believed first single man to adopt a child in California. The elapsed time of the story was less than four minutes. In that four-minute span, Bill Jones tells the story of his initial encounter with Aaron and his decision to adopt this little boy. In that four-minute span, Bill tells of his son’s mental and emotional struggles and Aaron’s ability – sometimes – to let his loving, kind nature shine through the darkness of addiction. In that four-minute span, Bill tells of Aaron’s succumbing to the disease of addiction at the age of 30. In that four-minute span, Bill’s story has me in tears; had me in tears because that could have been me. Bill was able to see deep into Aaron; he was able to see with his heart. Bill was able to separate the person from the disease. Bill was able to freely share God’s love for another human being – one who desperately needed to know that he was worthy of receiving love unconditionally. In return, Bill received Aaron’s love right back. He told of the time that Aaron, upon hearing Bill’s voice, came running up to him as a little boy and latched onto his legs with a vise-like grip. Aaron died due to his addiction just like countless others. I almost did too. There is no hell on earth like the hell of addiction – despair, hopelessness, loneliness, separation, degradation, worthlessness. I am one of the fortunate ones. I am in recovery. I have been in that hell and, through the grace of God working through people in my life, I have been on the path of wholeness with others and with God. It has not been an easy road, this road to wellness, but it is oh so worth the struggle! If you struggle with addiction of any kind or if you know of a family member or a friend who struggles please know that there is a better way. 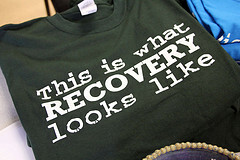 Seek out the help of professionals in recovery centers, self-help groups like AA or NA and rehabs. You’re not alone!